This was a hit last night with the family. I've adapted the recipe from one on Allrecipes.com. Heat oil in a large skillet over medium heat. Cook pork chops 5-6 minutes on both sides, or until done. Transfer chops to 9x13 baking dish. Melt butter in skillet. Stir in brown sugar, cinnamon, nutmeg, cloves, and salt and pepper. Stir in apples to coat. Reduce heat to low, cover, and cook for 3-4 minutes or until apples are tender. 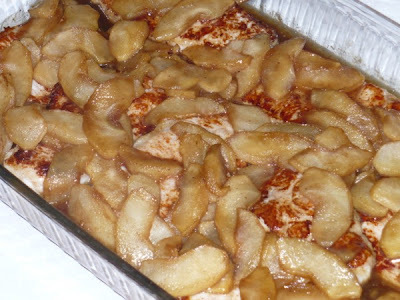 Remove apples with slotted spoon and place over chops in baking dish. To thicken sauce, in a small bowl whisk 1 Tbsp. cornstarch with 1 1/2 Tbsp. water. Slowly whisk cornstarch mixture into sauce, adding only as much needed for desired consistency. Cook for 2 minutes. Pour over apples and chops. Place dish in oven and bake for 10 minutes or until heated through.